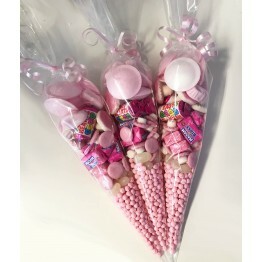 Beautiful sweet cones containing a selection of Pick & Mix Sweets which are ideal for adults as thank you gifts for baby shower parties. Attached to the sweetie cone is a personalised baby shower label - you can add the baby shower date and also the name of whom the baby shower is for. Select 'Baby blue' to for boy theme, 'baby pink' for girl theme, or 'Baby Blue & Baby Pink' for the sweet cone to include both pink and blue colours on the ribbon and tag. Please enter the wording required for your gift tag in the text box.